YOKOHAMA (Reuters) – In September 2007, despite weighty responsibilities at the helm of Nissan Motor Co and alliance partner Renault SA, Carlos Ghosn found time to get involved in a seemingly straightforward business decision. Two days before Nissan’s executive committee was due to formalise the choice of a company called TVS as a partner for sales and marketing in India, Mr Ghosn threw his weight behind a different firm: Hover Automotive India Pvt Ltd, four company sources with knowledge of the matter said. Hover had been a candidate but was knocked out of the running because it had been deemed insufficiently experienced in automotive distribution and marketing, they said. However, its founder and chairman, Moez Mangalji, was a close family friend of Mr Ghosn’s, the sources added. A Nissan executive wrote to the team preparing for the committee meeting saying it was Mr Ghosn’s wish that Hover be recommended over TVS, two of the sources said, adding that this was enough to ensure Hover got the job. The incident is part of Nissan’s wide-ranging probe into what it calls years of serious misconduct by Mr Ghosn. There is no evidence of Mr Ghosn benefiting from the decision but it is an example of conduct investigators believe helped his friends at Nissan’s expense, the two sources added. A spokesman for Mr Ghosn said the former Nissan chairman did not intervene on behalf of Hover, that Hover met key criteria to launch the distribution business, and all partnership decisions were made by Nissan’s executive committee. “The baseless accusations against Mr Ghosn and steady stream of leaks from certain Nissan executives are a transparent and dishonourable attempt to smear Mr Ghosn’s reputation, destabilise and reset the balance of power in the Alliance, and distract from Nissan’s alarming performance,” the statement from Mr Ghosn’s spokesman said. Mr Ghosn would continue to back Hover even after Nissan dealers in India began protesting in 2012 to executives about a collapse in sales, according to the sources, who declined to be identified, citing the sensitivity of the subject. At the same time, the sources acknowledge there was little resistance among the executive committee and other management to Mr Ghosn’s support for Hover and one other dealership decision in the Middle East that had raised eyebrows within Nissan. 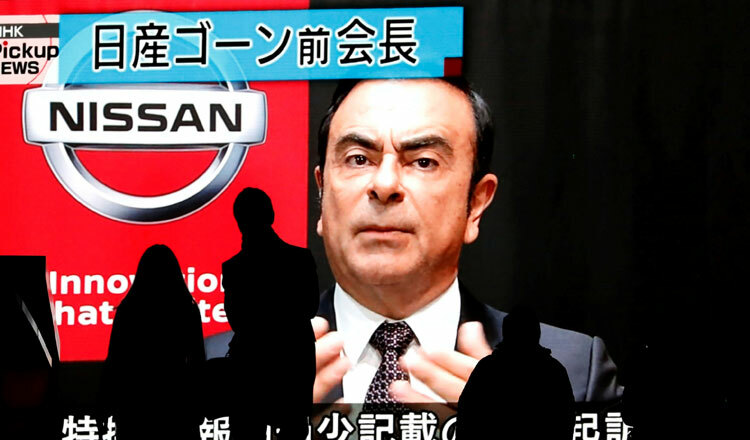 Looking back at Mr Ghosn’s reign, it is clear that too much power was concentrated in one man, and that management did not do enough, Nissan Chief Executive Hiroto Saikawa told employees in a town hall meeting one week after Mr Ghosn’s Nov 19 arrest. “Our biggest and most urgent task….is to undo the negative legacy that resulted from years of Mr Ghosn’s leadership and corporate governance,” he added. Last week, Nissan and major shareholder Renault said they would break up the all-powerful chairmanship position held by Mr Ghosn, with the chairman of Renault serving as head of the alliance but not as chairman of Nissan. The re-evaluation of Mr Ghosn’s legacy is also driving a broader shift in Nissan’s strategy, particularly Mr Ghosn’s practice of setting ambitious objectives for sales and profitability called ‘commitments’, where managers were held to account if they were not delivered. Not until 2017 did a lone internal auditor, Hidetoshi Imazu, discreetly start making checks into dealings that Nissan now says were orchestrated by Mr Ghosn. Mr Imazu had been aware of queries by Nissan’s external auditor Ernst & Young ShinNihon LLC about the purpose of a Dutch unit Zi-A Capital, according to one source. Payments for Nissan-owned luxury apartments used by Mr Ghosn were made through Zi-A Capital and its units, sources have previously said. Mr Imazu’s concerns also followed a June 2017 Reuters report that Renault-Nissan alliance bankers had drawn up plans to pay millions of dollars in undisclosed bonuses to Mr Ghosn and other managers through a separate Dutch unit, the source said. Mr Saikawa would only learn of the probe around October last year after Mr Imazu and Hari Nada, head of Nissan’s CEO office and an ally Mr Imazu later teamed up with, had turned their findings over to prosecutors, two sources said. Nissan declined to make Mr Imazu, Mr Nada and Mr Saikawa available for comment on this article. Tokyo prosecutors have accused Mr Ghosn of under-reporting $82 million in compensation for 2010-2018 – pay he had arranged to receive after his retirement. Mr Ghosn has said he is innocent and believed the compensation arrangements had been vetted by experts. Both Mr Ghosn and the Khaled Juffali Company have asserted the $14.7 million in payments were for legitimate business purposes. “Mr Ghosn is innocent of the charges brought against him and he will be vindicated,” the statement from Mr Ghosn’s spokesman said. The alleged schemes took so long to come to light, sources with knowledge of the probe said, due to Mr Ghosn’s practice of conveying his wishes verbally to trusted lieutenants rather than in writing. Many payments were made via the ‘CEO Reserve’, a budget for unplanned expenses, and were made through unconsolidated units which did not require vetting by the CFO or external auditors, they said. In addition to the case involving Mr Juffali, one key focus of the automaker’s probe is a sum of more than $30 million in Nissan funds Mr Ghosn arranged to have transferred via the CEO Reserve to a Nissan distributor in Oman owned by businessman Suhail Bahwan and whether the money was used to repay personal debt, the sources said. Mr Ghosn’s spokesman said payments of $32 million made over nine years were rewards for the Bahwan firm being a top Nissan dealer. Such dealer incentives were not directed by the CEO and the funds were not used to pay any personal debt for Mr Ghosn, the spokesman added. A spokesman for Mr Bahwan did not respond to requests for comment. Mr Ghosn’s spokesman said officials at Nissan, including Mr Saikawa and Mr Nada, had been aware of and had approved of the provision of the residences. Investigators are also examining payments to Mr Ghosn’s sister, Claudine Bichara de Oliveira, for what two sources describe as a fictitious job advising on global donation activities. An internal Nissan letter dated March 27, 2003 shows Mr Ghosn asked Ms Oliveira if she would work for Nissan’s global donation advisory council and that she signed the agreement. A source said, however, there was no evidence that the council existed. The spokesman, who also represents Mr Ghosn’s sister, said appropriate officials had approved the contract with the sister, and that Nissan officials opposed to Mr Ghosn were attacking his family with false accusations.